Like many travelers, when Andy and I explore new areas, we tend to do it on foot. This means I’m always looking for walking shoes to pack that will work for a variety of terrains and for a lot of different activities. Comfort is key. Bonus points if the shoes are cute. Imagine my excitement when I was approached by BucketFeet to try their shoes. Their website claims that they are “the most unique sneakers you’ll ever wear.” After checking them out, I’d have to agree. Every style is unique. Each one is created by a different designer, and every design tells a story. Their artists are located around the world, and they bring with them not only unique tales and talents, but also perspectives that make the designs captivating. The shoes are made in limited quantities and are guaranteed to start a conversation. The company was started by Raaja Nemani and Aaron Firestein who met while volunteering in Argentina. Raaja was off to travel the world and Aaron, an artist living in Buenos Aires at the time, gave him a pair of hand-crafted canvas sneakers for his travels. The design was inspired by the streets of the city, and they definitely sparked conversation. Two years later, in 2011, they created the company. 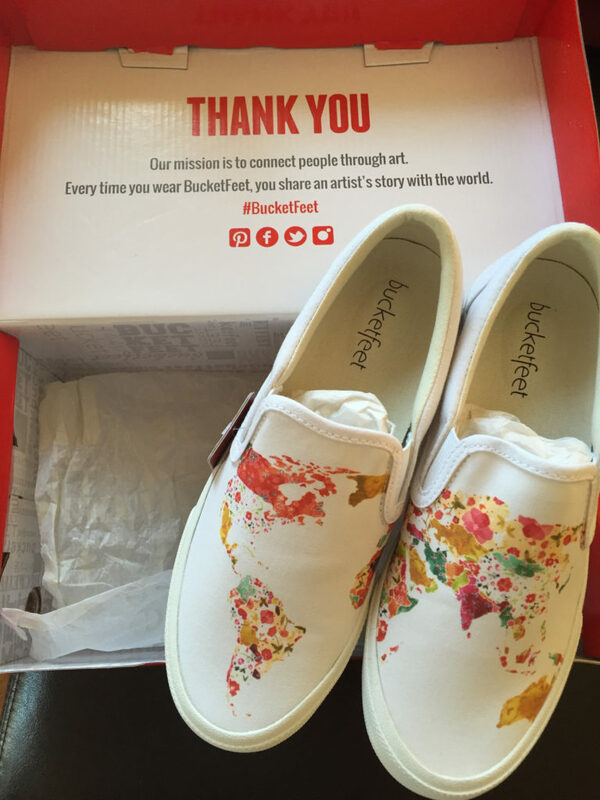 Artists across the globe are encouraged to join the BucketFeet team. They are given upfront compensation for every design, and they earn royalties. A portion of the proceeds from every shoe sold is donated in collaboration with a number of different non-profit organizations. Love the idea, want to be part of the process, but aren’t an artist? You can help curate their collection by voting on their website for proposed new designs. Though if you are like me, you might have a hard time picking a favorite. 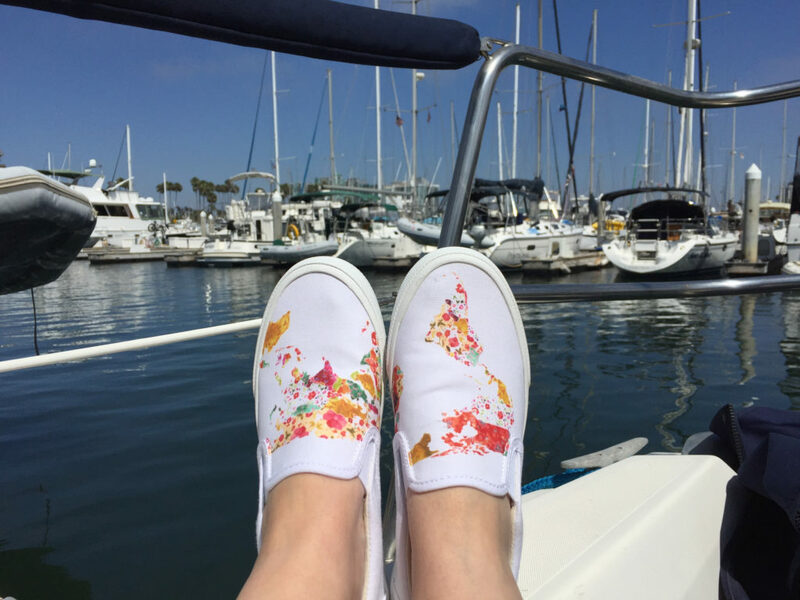 Which BucketFeet shoe did I try? I was sent the World Map (White) Slip On. It normally retails for about $65. The artist who designed the shoe’s colorful depiction of a world map, is Meera Lee Patel. She lives in Brooklyn, NY and describes the design as “a reminder of our shared world and a call to explore.” Seemed fairly appropriate for a travel writer! The look of these travel shoes was impressive. I love the colors and the message. They fit snugly, and I was immediately impressed with the bubble cushion insert. It feels like a little massage for the bottom of my feet. I was initially concerned that as they got dirty I would unwittingly add a new country or continent to the world map, but the shoes can be washed – I just have to remove the insole first. Wary of all new shoes, I started off wearing them slowly. 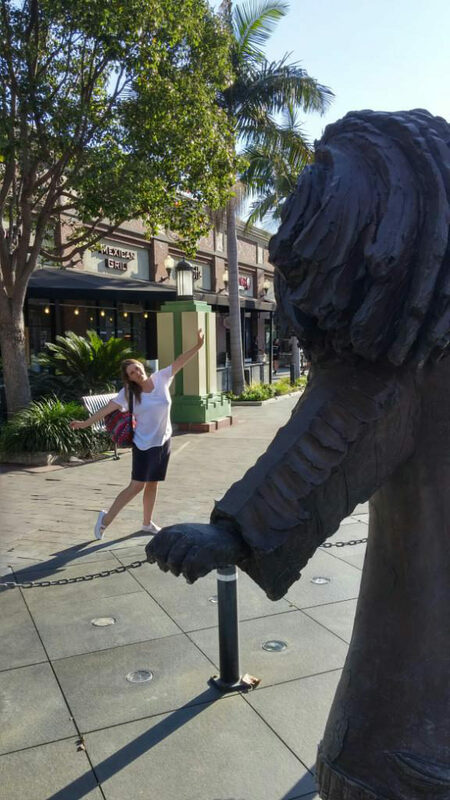 The first trip was just a wander around the neighborhood, the next was to down to the boat and the last (to date) was for happy hour in Culver City. The shoes were not too big, so I didn’t have to worry about slippage, and the bubble cushion insoles were quite comfortable. The design is lovely, and these travel shoes are so cute that I didn’t hesitate to pair them with a casual skirt (and would add them to a casual dress, too). They easily work with jeans and shorts, as well. People did remark on the design, so they were, in fact, conversation starters. They made for great boat shoes — no slipping and the white bottoms don’t leave scuff marks. So far, so good. And they are low enough that you can’t see them. Problem solved! I love the design of these travel shoes and the company’s philosophy appeals to me. The insoles are quite comfortable and the look works with many casual outfits which means they are likely to make the packing shortlist when I need a versatile, comfortable shoe. Shoes were provided to me by BucketFeet for my honest review. All opinions are my own and that of ThoseSomedayGoals.com.